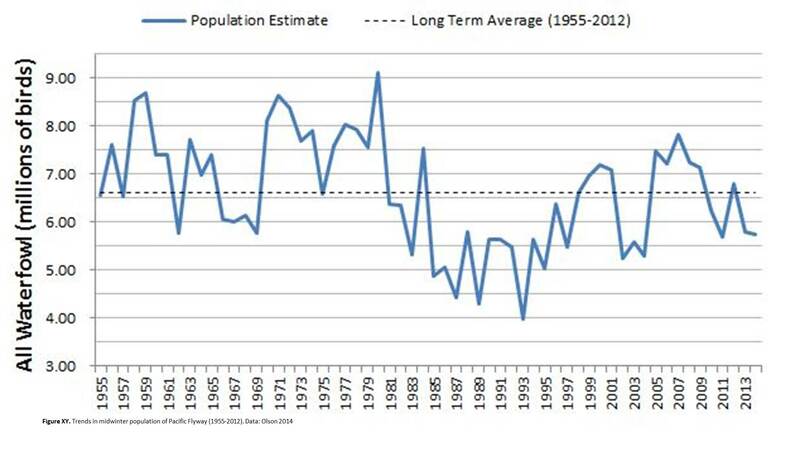 Duck populations have recovered from late-1980’s lows. Some species populations appear to be increasing while others are decreasing. Canada geese have become increasingly abundant in the Coos estuary since their reintroduction in the 1970s. There are few significant changes in wading bird populations statewide. Local populations appear to be relatively stable. The exception is cattle egret populations which have declined locally since the 1980’s. Brown pelicans appear to be more abundant in Coos Bay in recent years. Few other seabirds and shorebirds show clear trends. 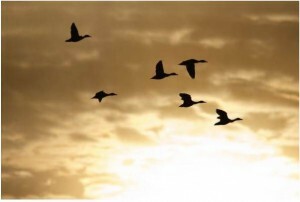 This section summarizes the status and trends of geese and ducks. Regional data are presented at a statewide level using breeding population estimates as a proxy for abundance. 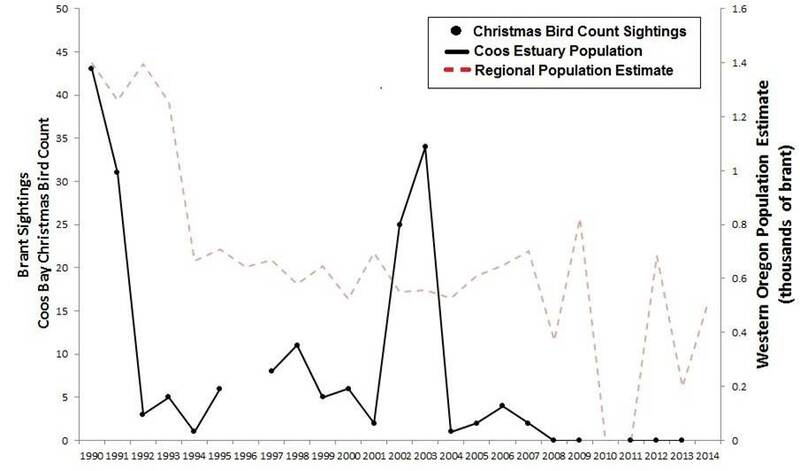 Coos estuary bird information is also presented which uses Audubon’s Christmas Bird Count (CBC) data from Coos Bay to characterize trends in local waterfowl abundance (Figure 1). Finally, a Local Waterfowl Trends section highlights waterfowl species that display the most apparent trends since the 1980s. Oregon is part of a North American migratory corridor known as the Pacific Flyway (see Background). During their annual midwinter survey, the United States Fish and Wildlife Service (USFWS) estimated approximately 5.76 million waterfowl in the Pacific Flyway, including all species of ducks, geese, and swans (Olson 2014). 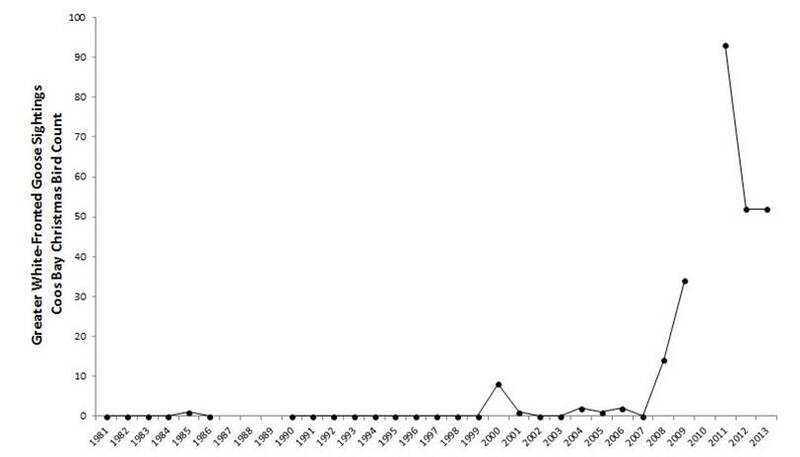 The estimated midwinter Pacific Flyway population has increased since record lows in the late 1980s and early 1990s, but has not recovered to historic levels (Figure 2). 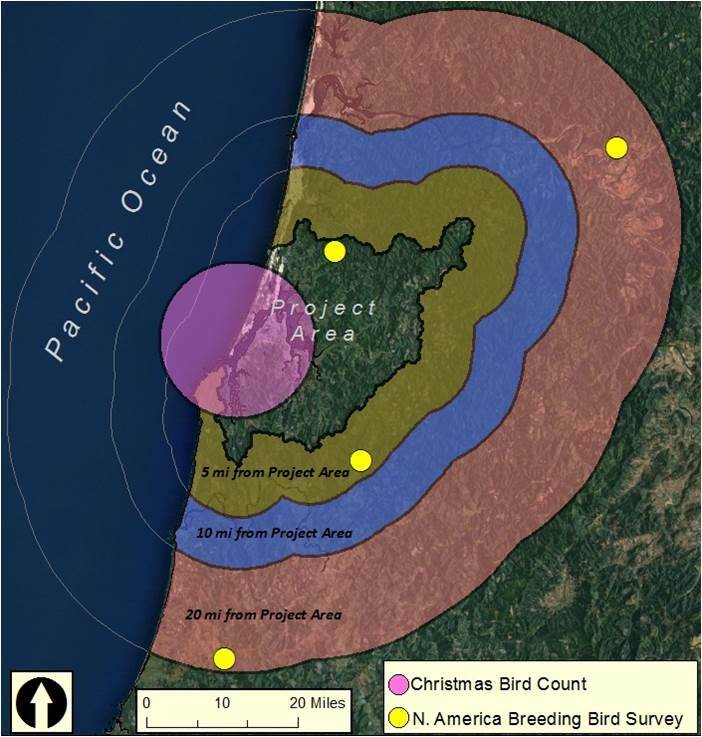 In Oregon, the midwinter Pacific Flyway survey is conducted in three survey zones (Figure 3). 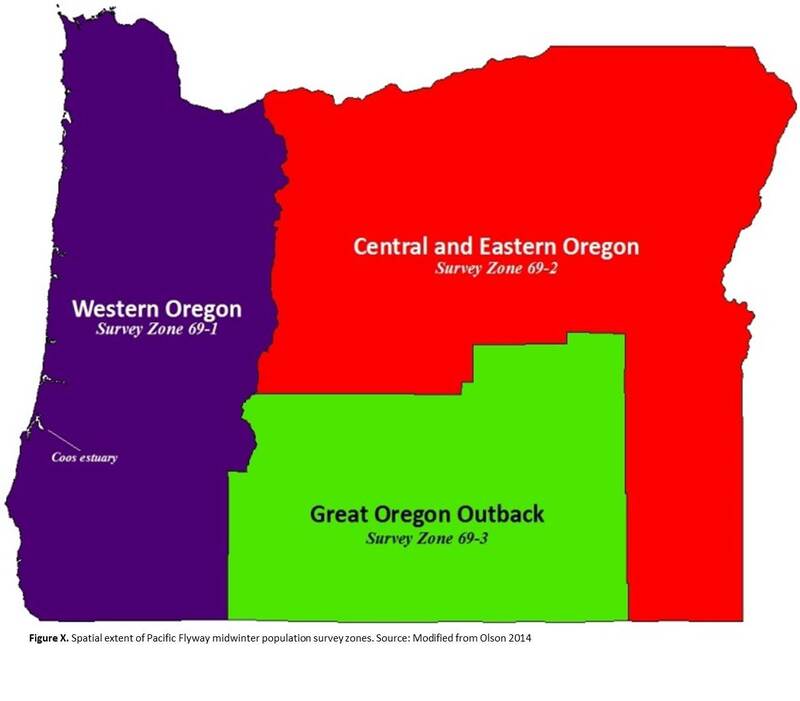 Figure 4 shows historic waterfowl abundance in Oregon (i.e., in all three of the Oregon midwinter Pacific Flyway survey zones); Figure 5 shows the abundance in western Oregon alone. 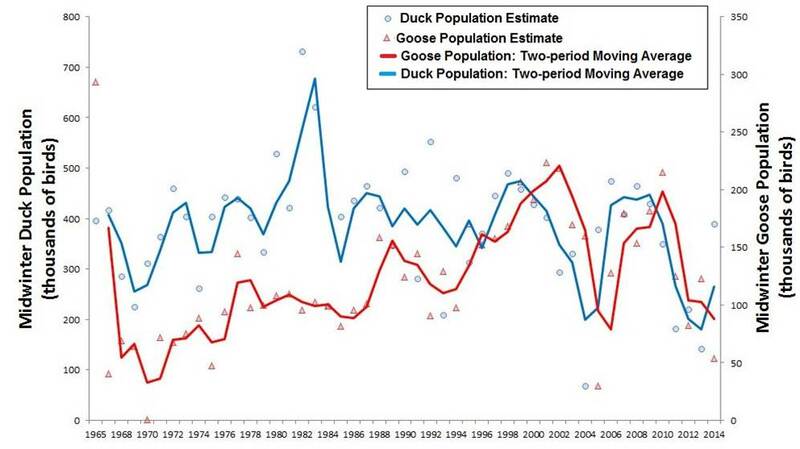 Since 1965, duck abundance statewide shows no clear trend. 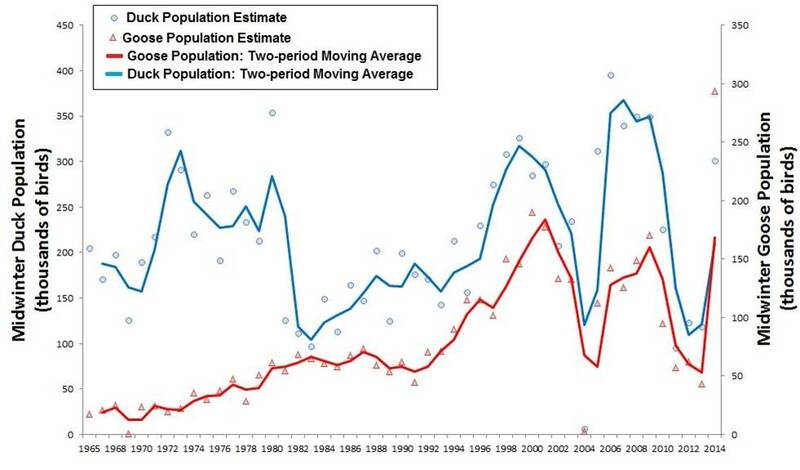 Goose abundance in Oregon generally increased from the early 1970s to the early 2000s. Oregon waterfowl populations (i.e., both geese and ducks) declined substantially in both the mid-2000s and in recent years. Annual variation in waterfowl abundance appears to be larger than average in the past 15 years than it has historically. Similar to statewide trends, the western Oregon duck population is neither consistently increasing nor decreasing. Duck abundance in western Oregon has been variable from year to year, with the greatest changes occurring in the early 1980s, the mid-2000s, and during recent years. Western Oregon goose abundance increased significantly from 1965-2000. However, similar to ducks, the regional goose population also declined in the mid-2000s and in recent years. Regional waterfowl trends mirror the statewide patterns in that waterfowl abundance appears to vary more in the past 15 years than it has historically. The United States Geological Survey (USGS) Patuxent (MD) Wildlife Research Center (2014) conducts the North American Breeding Bird Survey (BBS) which includes 144 survey sites in Oregon. One of the Oregon sites is located within the project area and three sites are located near the project area (Figures 1 and 6). This survey is conducted annually along preselected observational “routes.” The BBS data are used here as indices of relative bird species abundance and should not be interpreted as estimates of the total population size (D. Ziolkowski, pers. comm., 2014). 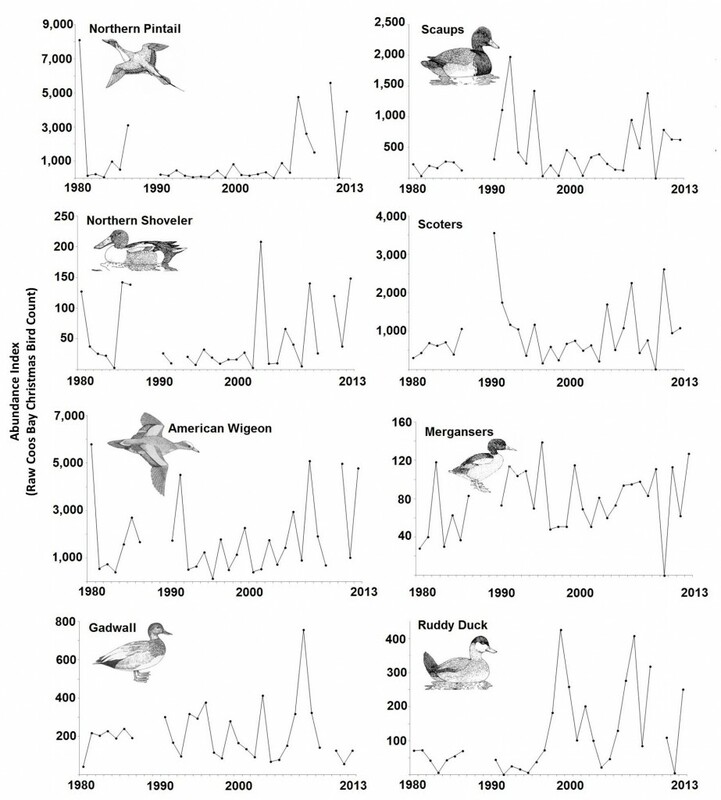 Figure 7 displays the BBS abundance data for six waterfowl species in Oregon which have displayed clear trends in relative population change between 1966 and 2012. It should be noted that some of these trends are subject to data limitations (e.g., small sample size) that can reduce the reliability of the results. Please see the chapter summary for more information about these limitations. Midwinter waterfowl sightings in the Coos estuary have increased over time for some species (e.g., Canada goose, mallards, and harlequin ducks) and decreased for others (e.g., brant, redheads, and canvasbacks). Some waterfowl species (e.g., buffleheads) are abundant in the study area but have displayed neither clearly increasing nor decreasing population trends over time. Similar to regional trends, Canada goose sightings have steadily increased over the past few decades (Cornu et al. 2012)(Figure 8). Historically, the local CBC recorded as few as one sighting per hour in 1991, a number that increased to more than eight sightings per hour by 2010 (T. Rodenkirk, pers. comm., January 19, 2012). Brant sightings have decreased since the mid-1980s. The CBC has not recorded any brant sightings since 2007 (Figure 9 black line). 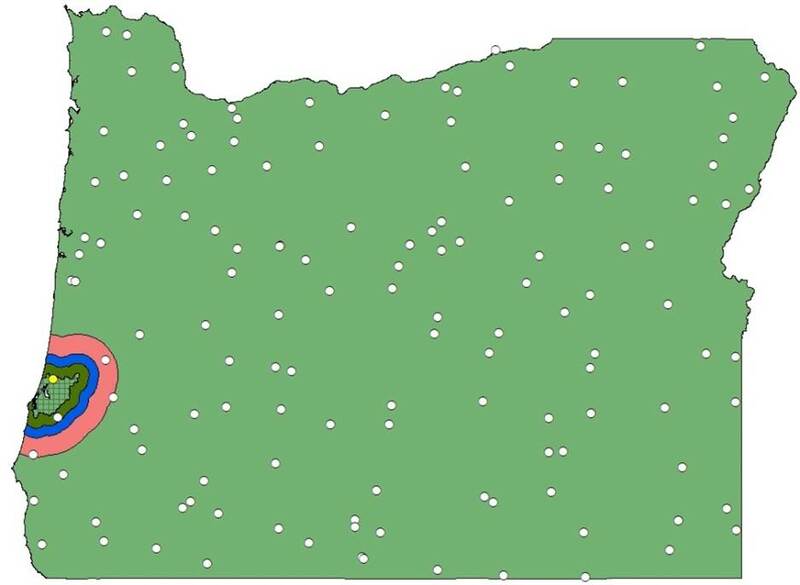 Brant have generally declined across western Oregon (Figure 9 dashed line). Historically, the greater white-fronted goose was not sighted in Coos Bay. However, sightings have increased dramatically since the late-2000s. 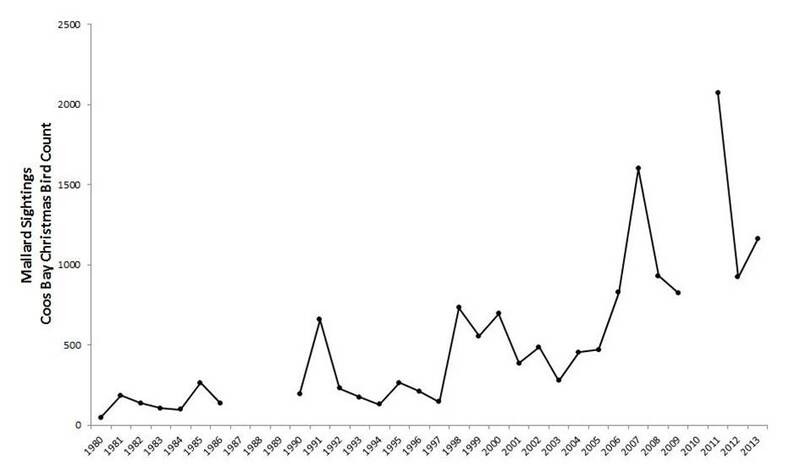 Local greater white-fronted goose populations remain much higher relative to previous decades (Figure 10). Mallards have been sighted in the lower Coos watershed every year during the Christmas bird count, and the number of sightings has steadily increased over the past decades (Cornu et al. 2012)(Figure 11). Redheads, once a relatively common CBC sighting in the Coos estuary, have not been recorded every year the CBC, especially since 1999. 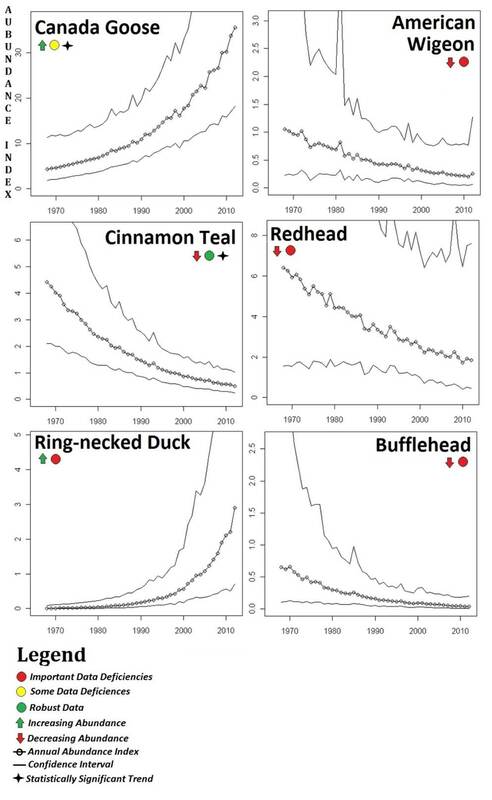 Redhead sightings appear to have fallen dramatically over the past few decades (Cornu et al. 2012)(Figure 12). Canvasbacks appear to be relatively abundant in the Coos estuary prior to the early 1990s. 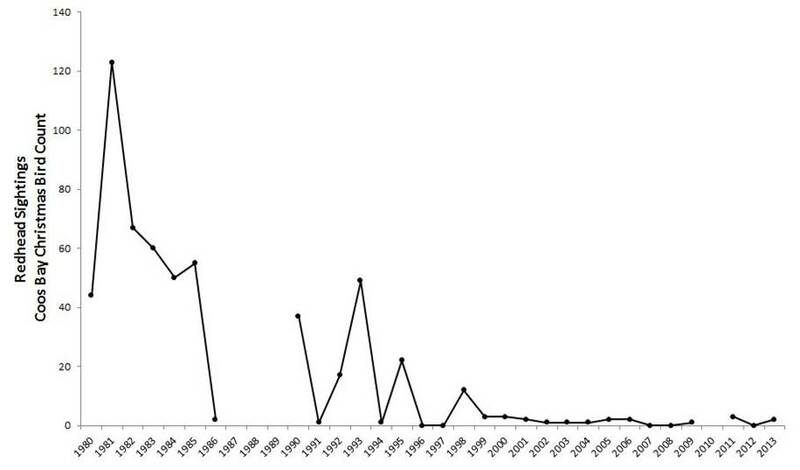 However, sightings have decreased dramatically over the past few decades (Figure 13). This trend, though more pronounced for the Coos estuary, generally matches the decline shown in the regional data. Harlequin duck sightings have increased throughout the early 2000s, with peak-levels occurring in the most recent years (Cornu et al. 2012)(Figure 14). In addition to the species mentioned above, several waterfowl species were observed during the local CBC every year since 1980 and are worth mentioning: northern pintail (Anas acuta), scaups (Aythya spp. ), American wigeon (Anas americana), mergansers (Mergus spp. ), northern shoveler (Anas clypeata), scoters (Melanitta spp. ), gadwall (Anas strepera), and ruddy duck (Oxyura jamaicensis). 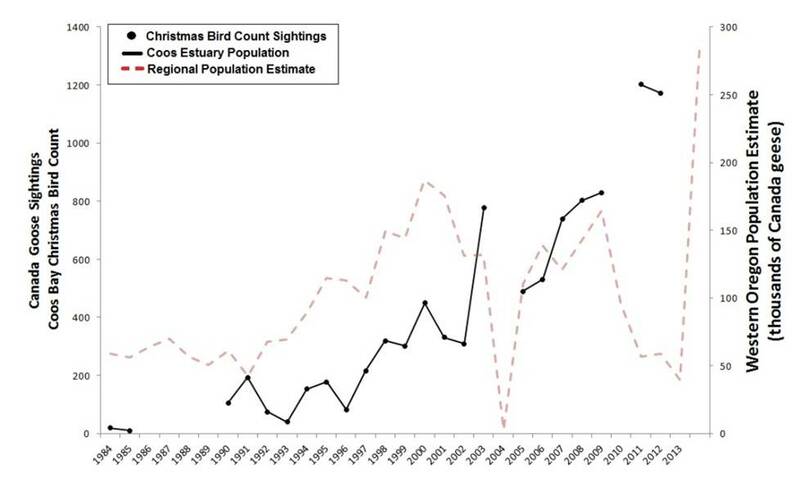 Although these birds commonly occur within the study area, they have displayed neither clearly increasing, nor clearly decreasing population trends over the past two decades (Figure 15). This section summarizes the status and trends of herons and egrets. Statewide abundance trends are presented using the BBS data (see Pacific Flyway, Statewide, and Regional Waterfowl Trends). This presentation is followed by a discussion of local data generated by the Coos estuary CBC. The Oregon BBS data include eight wading bird species that show either clearly increasing or clearly decreasing trends in the past several decades (Figure 16). These data indicate that breeding herons (i.e., the great blue heron, Ardea herodias, and black-crowned night heron, Nycticorax nycticorax, collectively) may have decreased marginally from 1980-levels. 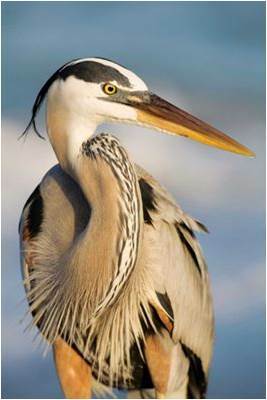 This interpretation is supported by Liebezeit and Larson (2014), who report that the BBS data show a declining trend for heron populations in both the Pacific Northwest region as well as in Oregon. However, they add that the decline does not appear to be statistically significant. Contrary to the marginal decline in heron abundance, breeding egrets (i.e., the great egret, Ardea alba, and the snowy egret, Egretta thula, collectively) appear to be more abundant in recent years than in the past. This species rapidly expanded its range in the 1970s and 80s (Cornu et al. 2012). It was observed in the Coos estuary every year during the CBC until 1986 but has not been sighted since (Audubon 2014, Rodenkirk 2012)(Figure 17). 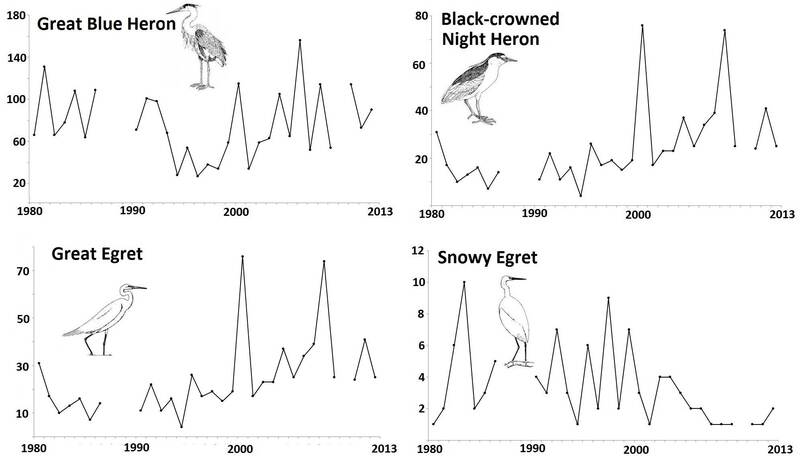 Several common heron and egret species have been observed during the Coos estuary CBC every year since 1980 (Figure 18). The great blue heron and great egret are the most abundant wading birds in the Coos system, with numerous CBC sightings (approximately 50-100) occurring every year (Audubon 2014, Rodenkirk 2012). In addition, the snowy egret and the black-crowned night heron are also commonly sighted but appear to be less abundant- fewer than 10 sightings most years (Audubon 2014, Rodenkirk 2012). Although these species occur within the study area, they have displayed neither clearly increasing nor clearly decreasing trends over the past two decades. 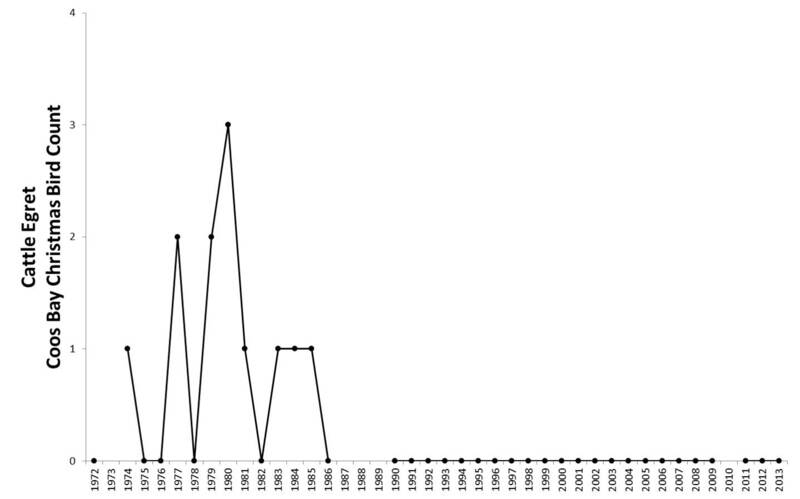 BBS data include eight seabird and shorebird species that exhibit clear trends in the number of sightings since 1966 (Figure 19). Historically, seabird and shorebird species have been abundant in the Coos estuary. 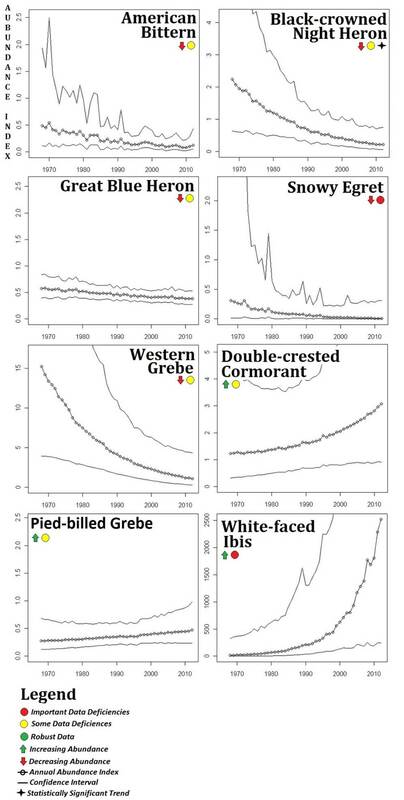 While some species’ local presence exhibits increasing or decreasing trends, most have displayed neither clearly increasing nor clearly decreasing trends. Their historical abundance is characterized by substantial “interannual variability” (i.e., substantial changes from year-to-year) and statistical “noise” (i.e., unexplained variation or randomness that deviates from long-term trends). 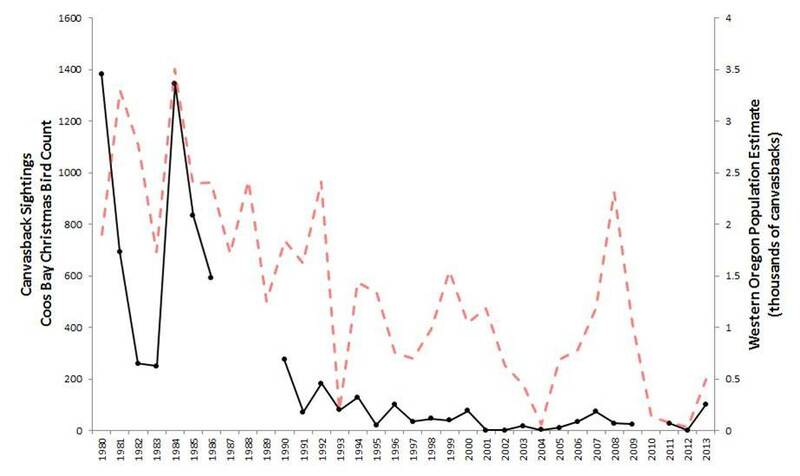 Below we focus on two seabird and shorebird species that have exhibited clear trends over time. Because of their special status, we focus on two additional seabird and shorebird species, double-crested cormorant (Phalacrocorax auritus) and snowy plover (Charadrius alexandrinus), in greater detail in the Birds of Special Concern data summary. Brown pelicans averaged about seven Coos estuary CBC sightings annually from 1980-2000 (Audubon 2014, Rodenkirk 2012). However, anomalously high brown pelican counts occurred from 2002- 2009 (813 annual sightings on average) with the largest anomaly (2,717 sightings) occurring in 2008 (Cornu et al. 2012; Audubon 2014, Rodenkirk 2012). Brown pelican sightings have since returned to pre-2002 levels. Local CBC efforts reported 20 sightings in 2011, 8 sightings in 2012, and no sightings in 2013 (Audubon 2014, Rodenkirk 2012). In 1973, USFWS listed the brown pelican as a federally endangered species (USFWS 2009). It was removed from the endangered species list in 2009 due to recovery (see Why is it happening? )(USFWS 2009, 2014a). However, it remains listed by the Oregon Department of Fish and Wildlife as an endangered species in Oregon (ODFW 2014). The CBC has not sighted Whimbrel in the Coos estuary since 1982 (Cornu et al. 2012, Audobon 2014). Local bird experts speculate that citizen scientists may have confused this species with the long-billed curlew (Numenius americanus) in previous counts (T. Rodenkirk, pers. comm., January 19, 2012). The long-billed curlew is seen more regularly, although in small numbers (Cornu et al. 2012, Audubon 2014, Rodenkirk 2012). Historically, northern fulmars are rarely sighted during the local CBC, with only two sightings prior to 1980 (Cornu et al. 2012, Audubon 2014, Rodenkirk 2012). However, sightings have since increased, occurring on seven separate occasions between 1980-1997 (Audubon 2014, Rodenkirk 2012). There have been 28 seabird and shorebird species counted every year since 1980 during the Coos CBC. The majority of these species do not exhibit any clear abundance trend. However, data for a few species may suggest weak trends (e.g., red-necked grebe, western sandpiper, etc.). Table 1 presents data describing the relative abundance of the 28 most common seabird and shorebird species in the Coos estuary. Resident and migrating waterfowl, wading birds, seabirds, and shorebirds are inextricably linked to wetland habitats, which they use for food, shelter, nesting, and roosting (ODFW n.d., NRCS 2005). As with other animals, the abundance of local bird populations is determined by a complex set of biophysical relationships. Local bird population shifts often result from a combination of several factors, including human activities, climatic variables, and biological interactions. These factors can work together to change the suitability of wetland habitat, affecting local bird species abundance. Some aquatic birds are highly migratory and depend on many other (sometimes distant) terrestrial systems (e.g., grasslands, forests, tundra, rocky offshore islets, etc. )(NAWMP 2012). For this reason, it can be difficult to understand the exact reasons behind local trends, because seemingly unrelated factors affecting far away habitats may have a direct impact on survival rates and, therefore, local abundance. In 1986, the United States and Canadian governments outlined strategies for the conservation, protection, and enhancement of waterfowl habitat in the North American Waterfowl Management Plan (NAWMP; the Plan). Mexico became a Plan signatory in 1994. 1. Abundant and resilient waterfowl populations to support hunting and other uses without imperiling habitat. 2. Wetland and related habitat sufficient to sustain waterfowl populations at desired levels, while providing recreational areas and ecological services that benefit society. 3. Growing numbers of waterfowl hunters, other conservationists, and citizens who enjoy and actively support waterfowl and wetlands habitat. A substantial amount of research examining the factors that influence waterfowl abundance has been focused on an area called the “Prairie Pothole Region” (PPR)(Figure 20). Although the PPR represents only 10% of North America’s waterfowl breeding habitat it accounts for over 50% of the continent’s duck population (Wong et al. 2012). The PPR research has shown that waterfowl abundance is correlated with several variables, including both climatic (i.e., precipitation, soil moisture, and pond density) and land-use attributes (i.e., agricultural activities)(Podruzny et al. 2002, Baldassarre et al. 1994, Bethke and Nudds 1995, Miller 2000). In the Pacific Flyway (Figure 2), waterfowl abundance declined to historic lows in the late-1980s and early-1990s (Page et al. 1992, NAWMP 2012, Olson 2014, USFWS 2014c). Following the decline, waterfowl populations recovered throughout the 90s. However, they declined again in both the mid-2000s and recent years (USFWS 2014b). The decline of waterfowl in the late 1980s and early 1990s was due, in part, to habitat loss. Approximately 53% of all original wetland habitat in the contiguous United States had been converted to human land uses by 1985, including wetlands in the PPR and along the Pacific Flyway that were diked/drained or filled for agricultural, industrial, and residential development (USFWS 2014c, Page et al. 1992). The loss of wetland habitat likely contributed to sharp decline of many wetland-dependent species during these years (Page et al. 1992). Figure 21. Midwinter abundance of both geese and ducks in the Pacific Flyway (red) plotted against December “dryness” (i.e., a measure of both precipitation and temperature) in Oregon (1995-2014). Dryness is indexed using the Palmer Drought Severity Index (PDSI), which uses both precipitation and temperature to measure dryness; positive values correspond to wet years and negative values represent dry years. Generalized periods of drought (2000-2005 and 2008-2014) are highlighted by blue boxes. Data: USFWS 2014a, NOAA 2014. The recovery of waterfowl populations in the 1990s was largely due to increased habitat restoration efforts. The North American Waterfowl Management Plan (NAWMP, the Plan; see sidebar), an international agreement designed to restore waterfowl populations by protecting, enhancing, and restoring habitat, was signed in 1986 (USFWS 2014c). Since the implementation of the Plan, “joint ventures” (i.e., partnerships between stakeholders, including but not limited to federal, state, provincial, tribal, and local governments) have made strategic investments totaling $7.5 billion to protect, conserve, and restore 22 million acres of key waterfowl habitat across North America, resulting in substantially larger populations in many cases (USFWS 2014c, NAWMP 2012). Declines in waterfowl abundance since 2000 may be related to climatic trends. 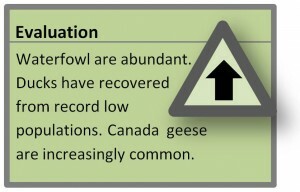 In their Waterfowl Population Status Report, USFWS (2014d) notes that, “In the Pacific Flyway, below-normal winter precipitation and snowpack [in 2013] led to continued poor habitat conditions in many areas.” They go on to cite below-normal winter precipitation as a cause of deteriorated habitat conditions in western Oregon. Climate data in Oregon appear to align with waterfowl abundance (Figure 21). Periods of drought are followed by periods of reduced waterfowl abundance. While climatic variables likely contributed to the waterfowl abundance trends, some unexplained variation remains. Goose populations in Oregon have consistently increased since the 1970s (USFWS 2014b). The Subcommittee on Pacific Population of Western Canada Geese (2000) explains that a series of Canada Goose transplanting programs and natural population growth has resulted in the expansion of this species’ historic distribution. They add that the goose’s range expansion has been supported by numerous management programs (e.g., provision of nesting structures) designed to increase the production of Canada geese in the western United States. Local bird experts note that introduced populations of Canada Geese have been present in Coos County since at least 1976. The CBC recorded double-digit Canada goose sightings in 1984, and their findings have been increasing ever since (T. Rodenkirk, pers. comm., January 19, 2012, 2012b). Local wading bird populations have displayed few clear trends in the past decades. CBC data in the Coos system suggest that cattle egret populations may be less abundant in the Coos estuary now than they were prior to the mid-80s (Audubon 2014, T. Rodenkirk, pers. comm., January 19, 2012). 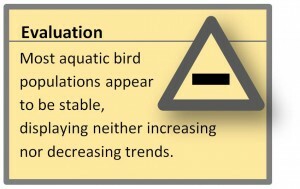 Similarly, the BBS suggests that several species of wading birds may be in decline in Oregon, but these trends are generally not statistically significant (See Figure 16)(USGS 2014). Similar to other aquatic birds, the conversion of wetland habitat for agricultural, residential, commercial, and other land uses may threaten their well-being or directly affect wading bird abundance (NRCS 2005). It’s important to recognize that habitat limiting factors (e.g., wetland conversions to human uses, poorly implemented compensatory wetland mitigation projects, declines in water quality, etc.) could lead to declines even in wading bird populations that currently appear to be relatively stable (Liebezeit and Larson 2014). 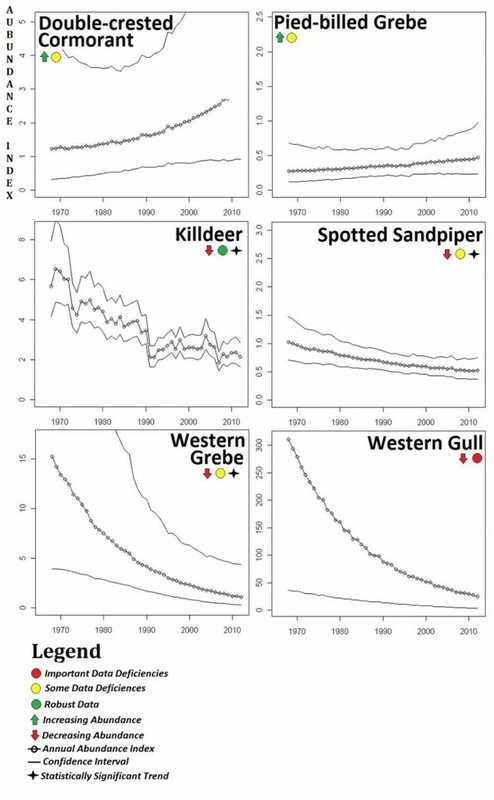 Most seabird and shorebird populations in the study area have shown neither a clearly increasing nor a clearly decreasing population trend over the past few decades (Table 1). 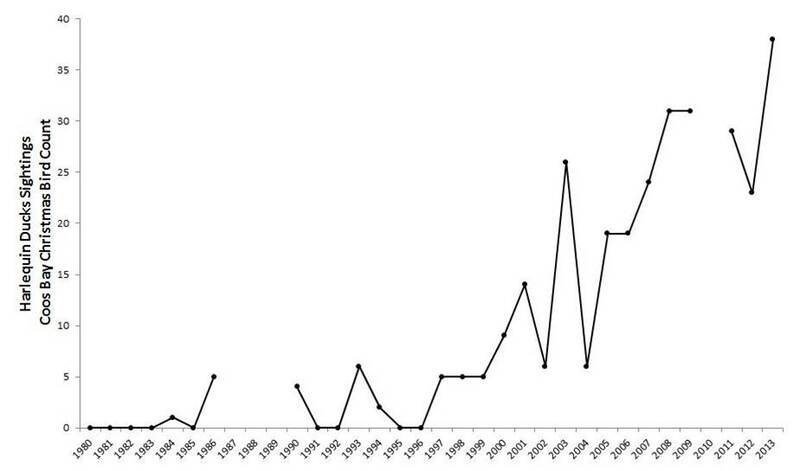 There are two notable exceptions: the local brown pelican populations appear to have recovered since the 1980s, while whimbrel populations have declined (Audubon 2014, T. Rodenkirk, pers. comm., January 19, 2012). The USFWS (2009) explains that brown pelican populations declined in the early 1970s primarily due to exposure to DDT and other contaminants, which affected pelicans’ ability to produce hard egg shells. Decreased food availability and human disturbance of nesting colonies during that time also affected brown pelican populations. USFWS suggests that regulations and restrictions controlling the use of DDT and other contaminants as well as the establishment of nesting reserves have led to a successful recovery. The local trend of declining whimbrel populations may reflect data quality assurance and control concerns. CBC data are the best available tool for tracking the status and trends of local bird populations. These data are generally reliable, because bird sightings are most often recorded by, or in the presence of, observers with ample birding knowledge. However, not all sightings take place in the presence of experienced birders so there’s always the possibility for error. Tim Rodenkirk (pers. comm., January 19, 2012), a local bird expert and long-time coordinator of the Coos Bay CBC, speculates that early Coos Bay CBC volunteers may have confused the whimbrel with the long-billed curlew. The long-billed curlew is seen in the Coos estuary more regularly, although in small numbers (Cornu et al. 2012, Audubon 2014, Rodenkirk 2012). For more information about data concerns, see the Chapter Summary. Shorebirds use the Coos estuary in winter and during migration for many purposes (e.g., roosting and foraging). Foraging flocks tend to occupy the habitat around the estuary (Rodenkirk 2012). The abundance of flocks in proximity to the estuary is influenced largely by food availability, access to exposed mudflats, presence and exposure to predators, and human disturbance (Cornu et al. 2012). During high tide, human disturbance affects the distribution of roosting shorebirds (Peters and Otis 2007). The Coos estuary is used extensively for recreational fishing, crabbing, and shellfish harvesting, and its shores used for ATV riding, camping, hiking, horseback riding, and other activities. In some cases, human disturbance can create roosting habitat. For example, one of the best high tide roosts for shorebirds in the project area is located on the North Spit in the Lower Bay Subsystem. Historically, birds roosted here in the deflation plain at the site of an effluent holding pond for a Weyerhaeuser pulp mill. However, after the closure of the mill, natural succession has reclaimed the site, limiting the suitability of this habitat for shorebird roosting. The Cape Arago Audubon Society is working with the Oregon International Port of Coos Bay to develop a habitat management plan that would support features necessary for high-tide roosting in this area. Baldassarre, G. A., E. G. Bolen, and D. A. Saunders. 1994. Waterfowl Ecology and Management. New York City, NY: John Wiley & Sons, Inc.
Bethke, R. W. and T. D. Nudds. 1995. Effects of Climate Change and Land Use on Duck Abundance in Canadian Prairie-Parklands. Ecological Applications 5: 588–600. Csuti, B. A., T. A. O’Neil, M. M. Shaughnessy, E. P. Gaines, and J. C. Hak. 1997. Atlas of Oregon Wildlife, first edition. Corvallis: Oregon State University Press. Miller, M. W. 2000. Modeling Annual Mallard Production in the Prairie-Parkland Region. Journal of Wildlife Management 64: 561–575. Olson, S. M. (compiler). 2014. Pacific Flyway Data Book. United States Fish and Wildlife Service. Vancouver, WA. Peters, K. A. and D. L. Otis. 2007. Shorebird Roost-site Selection at Two Temporal Scales: is Human Disturbance a Factor? Journal of Applied Ecology 44: 196-209. Podruzny, K. M., J. H. Devries, L. M. Armstrong, and J. J. Rotella. 2002. Long-Term Response of Northern Pintails to Changes in Wetlands and Agriculture in the Canadian Prairie Pothole Region. Journal of Wildlife Management 66: 993–1010. Rodenkirk, T. J. 2012. 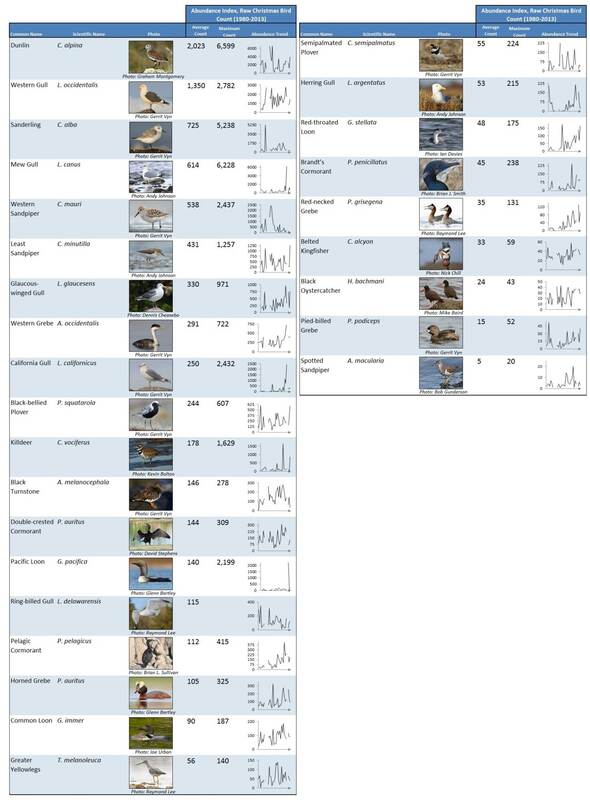 Birds of Coos County, Oregon: Status and Distribution. [Unpublished Manuscript]. Rodenkirk, T. J. n.d. Map of Christmas Bird Count Coverage Area. [Unpublished Data]. Subcommittee on Pacific Population of Western Canada Geese. 2000. 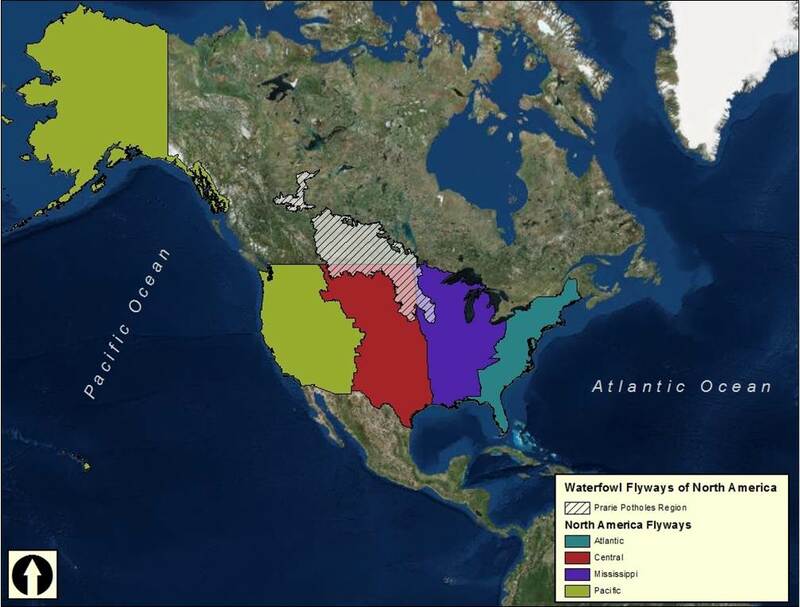 Pacific Flyway Management Plan for the Pacific Population of Western Canada Geese. [Unpublished report]. Pacific Flyway Study Committee (c/o USFWS, MBMO). Portland, OR. Wong, L., C. van Kooten, and J. A. Clarke. 2012. The Impact of Agriculture on Waterfowl Abundance: Evidence from Panel Data. Journal of Agricultural and Resource Economics 37(2): 231-334.